Ancient literary sources state the Temple of Janus stood near the Theater of Marcellus, but excavation of its remains did not occur until 1932/33. At first glance, Piranesi appears to confuse the issue by inserting two buildings dedicated to Janus near the Theater of Marcellus, a Templum Jani (1) next to the Porta Triumphalis (2) and an Aedes Jani (3) next to the Porta Carmentalis. (Aedes also means temple.) Upon inspecting the plans of both temples, it is the Aedes Jani that offers the more correct representation of the ancient Temple of Janus in that is has two doors opposite each other, which were open during times of war and closed during times of peace. This "correctness" of the Aedes Jani then raises the question as to why Piranesi also includes the Templum Jani. 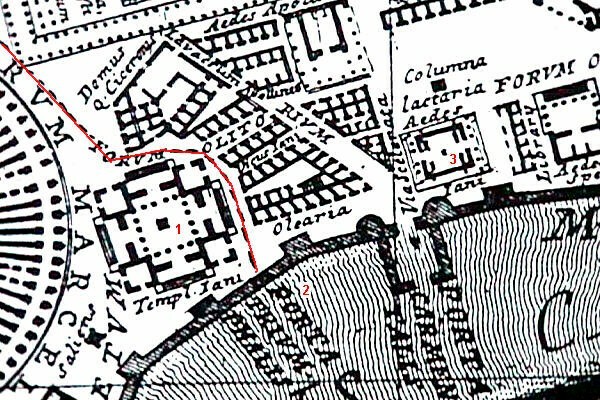 As with the Aedes Jani, the answer lies in the Templum Jani's plan, which is a unique four-sided square temple in the shape of a cross, most unlike the standard Roman temple. The four sidedness of this temple plan is an obvious reference to the Arch of Janus Quadrifrons, a rare example of a four-way arch that still exists in today's Rome at the western foot of the Palatine Hill. The Temple (Aedes) of Janus dates from 260 BC while the Arch of Janus dates from 315 AD, and Piranesi's cross-reference of these two structures elicits a poignant association between Janus, the god with two faces looking in opposite directions, and the emperor who erected the Arch of Janus, Constantine the Great, the first Roman emperor to convert to Christianity. 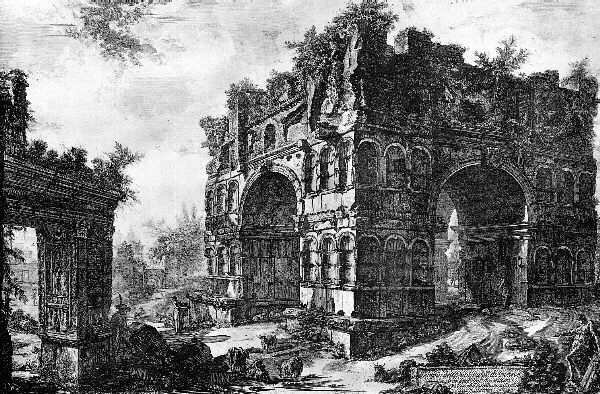 When Constantine first marched triumphantly into Rome, which was exactly one day after his conversion to Christianity, Rome's new hero chose not to follow the Triumphal Way's traditional pagan route, and thus, through the overt and covert symbolism of the Ichnographia's Templum Jani, Piranesi's Triumphal Way takes on a second, albeit inverted narrative. Simply put, the Triumphal Way of the Ichnographia is one path with two opposite directions.